The harvest for U.S. winter wheat is nearing completion, with the most recent Crop Progress report published by the USDA indicating that 74% of winter wheat is harvested across the 18 largest growing states. As the harvest progresses, the USDA updates their final yield and production forecasts. The most recent forecast released on July 12 predicts a final U.S. yield of 48.0 bushels per acre and U.S. production of 1.19 billion bushels, down from last year’s final estimates. 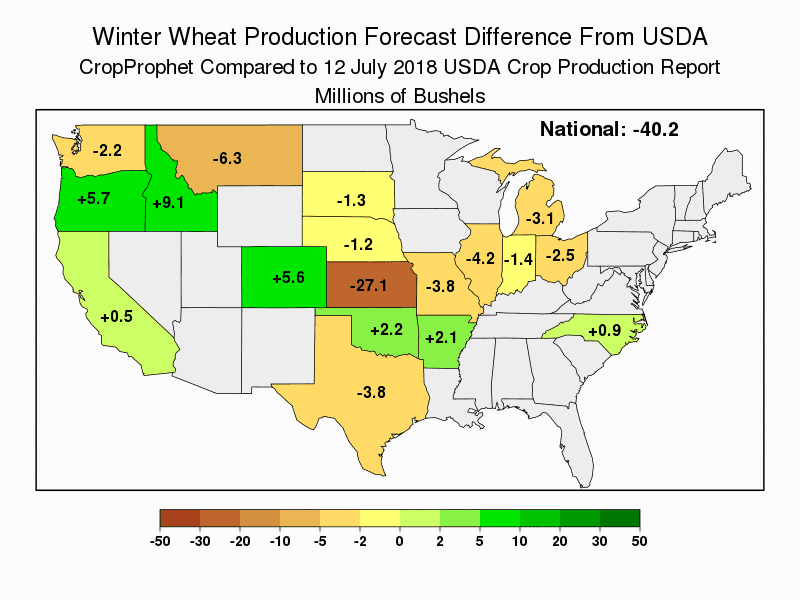 CropProphet winter wheat forecasts ended on June 13, as the model does not ingest harvesting information (read the final winter wheat commentary here). The final CropProphet winter wheat yield and production forecasts were 45.5 bushels per acre and 1.15 billion bushels, respectively. To compare with USDA, CropProphet was 2.5 bushels per acre and 40.2 million bushels below the USDA’s latest national estimates. Below we illustrate the difference between the CropProphet and USDA forecasts at the state-level. CropProphet shows good agreement with the USDA estimates in the central Plains and in the key growing state of Washington. 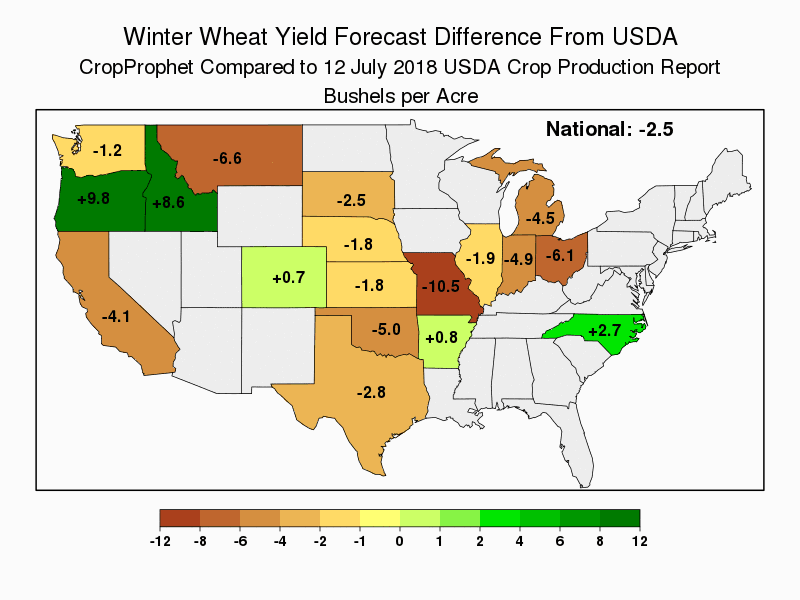 However, the CropProphet yield forecast is considerably lower from Oklahoma northeastward to the Great Lakes and Ohio Valley. In particular, Missouri shows the greatest deviation in winter wheat yield by -10.5 bushels per acre, largely due to a steady yield decline from excessive warmth during May. From Texas to Kansas, winter wheat yield prospects were very poor owing to damaging drought conditions. Compared to the USDA, the CropProphet yield forecasts were relatively optimistic in the Pacific Northwest. Both Oregon and Idaho experienced good growing conditions, causing the CropProphet models to respond positively with increased yield prospects. While CropProphet does not make use of realtime harvesting information, the comparison shown here illustrates the power of a wide variety of weather and satellite predictors for quantifying crop yield and production. CropProphet also has the advantage of incorporating both daily weather updates and daily weather forecasts to refine crop forecasts as early as possible. This entry was posted in Winter Wheat. Bookmark the permalink.